Convert ODF files to PDF from OpenOffice or LibreOffice. This article is about using novaPDF to convert an ODF file to a PDF document from either OpenOffice or LibreOffice (a fork of OpenOffice created by The Document Foundation). Use the Download page to download and install the novaPDF printer driver if you do not have it yet installed on the computer to be able to make the conversions. OpenOffice is an open source office suite containing applications for creating word documents, presentations, spreadsheets, drawings, databases and containing a large template support to help the users as best as possible in achieving their project goals. A huge advantage of the OpenOffice application Suite is the cross platform deployment capability and support, making it ideal for users having the same projects and working on operating systems different from Windows such as MacOS, Linux, Unix distros etc. The installer also includes the Sun Java SDK environment for custom development and for users that want to help with work on any of the suite aspects (coding, testing, design, support etc). The ODF file type represents the native formula document extension and it is used for files containing mathematical expressions, functions and formulas. The file can be opened and managed by both OpenOffice and a fork development suite called LibreOffice that basically does the same things as OpenOffice does but it is developed by a different organization called The Document Foundation. Despite the cross platform advantage you still need either OpenOffice or LibreOffice installed on the PC to manage the file type so having it in PDF format is very useful when porting it on a mobile device, when sharing the file with other people or when managing your projects with your other colleagues. Having novaPDF installed for the PDF conversion makes it even easier as all you have to do is select the Print button on the application interface and you are done. Additional options like bookmarking, watermarking, signatures, file security features, merging, mail sending are also available so you do not have to use additional programs for them. 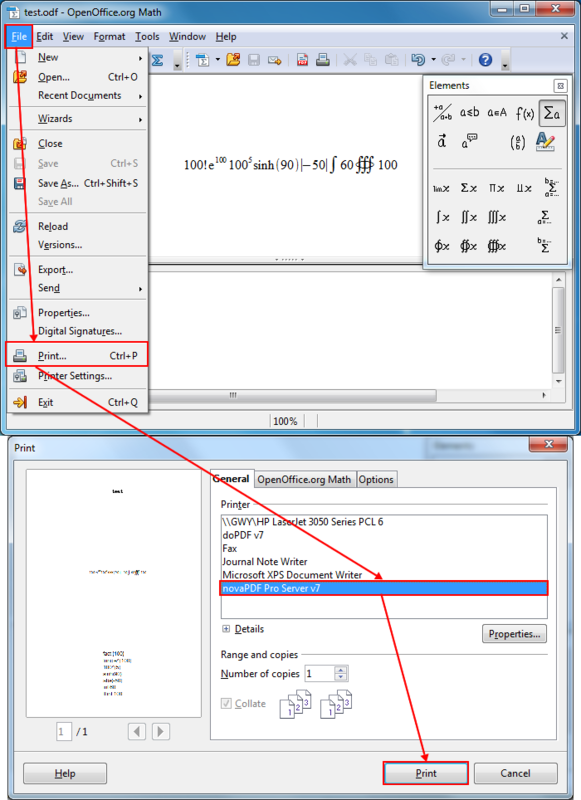 As a conclusion, ODF is specifically created for calculations and mathematics in the Math application and PDF compensates it by being a standard for portability and file compression, therefore being useful for further handling the file after being created in the OpenOffice Suite.